Lee Shipley is the man behind Señor Buddha. Well-travelled and well-fed, he used his experiences to create a menu with a twist. And so was born Señor Buddha, which has made its home on Preston Street, Brighton after starting life as a pop-up project. Lee started creating food based on his two favourite cuisines; East Asian and Spanish. And that is the premise of Señor Buddha. 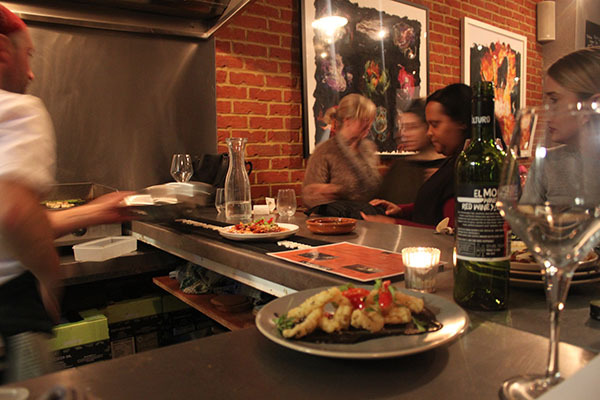 A fusion of Asian and Spanish Tapas, certain to appeal to many palates. 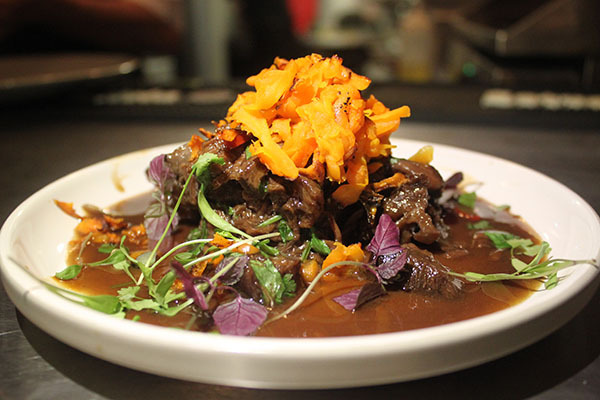 Priding itself on fresh, aromatic, colourful food and big flavours, so true of these two cuisines, Señor Buddha strives to bring the people of Brighton something a little different… and thought provoking. Señor Buddha has an intimate and relaxed atmosphere. The décor is cosy but modern. 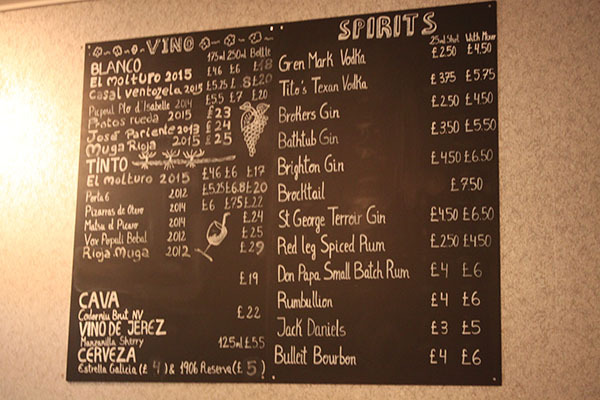 The walls are decorated modestly, with a few abstract pictures hanging and a ‘boozy blackboard’ boasting an array of Spanish wines dominating one side of the restaurant. We are greeted by an enthusiastic waitress – the only one working in actual fact – and seated at the pass. We clock the head chef who is hard at work, along with one other person in the kitchen. This is a small operation and the restaurant is busy. From our front row seat, it’s apparent head chef John Reed has everything under control. I enjoy sitting on the pass. It changes the dining experience – I would call it an immersive dining experience. There’s something nice and transparent about restaurants who are happy to seat people like this. It makes me confident Señor Buddha has nothing to hide and everything to show off! We are handed our paper menu. I’ve always thought a paper menu indicates an ever changing menu – makes it easier to add the new and remove the old. It’s modest, just one side of A4, but it’s brimming with mouth-watering dishes. 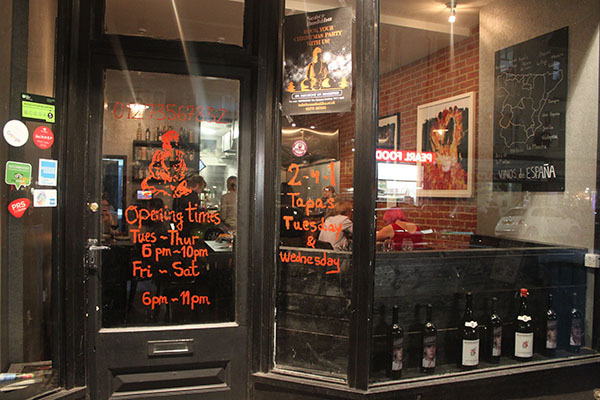 Quite simply the menu is split into two halves – Raciones (portions) and Tapas (snacks). We are recommended to choose two to three dishes each. John has some recommendations, which is fine by us. We happily put the emphasis back onto him. He suggests that we try Señor Buddha’s new dishes, which have been recently added to the menu. In a unified manner we nod our heads unreservedly. I could sense this was going to be exciting. We don’t order it, but the waitress brings us an aperitif. I think it is reminiscent of Sake. 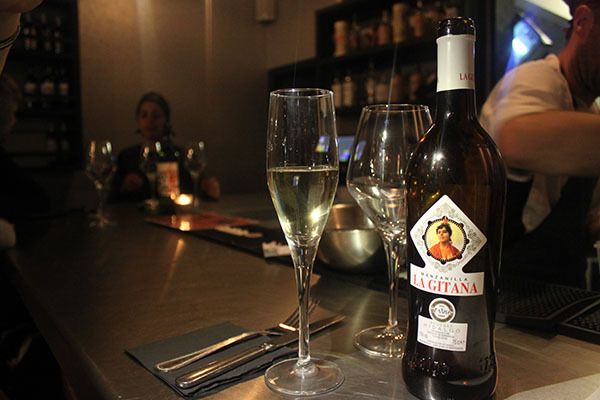 My partner says it reminds him of a Sherry, and he is right – La Gitana Manzanilla is a dry wine and the lightest and most delicate member of the Sherry region. 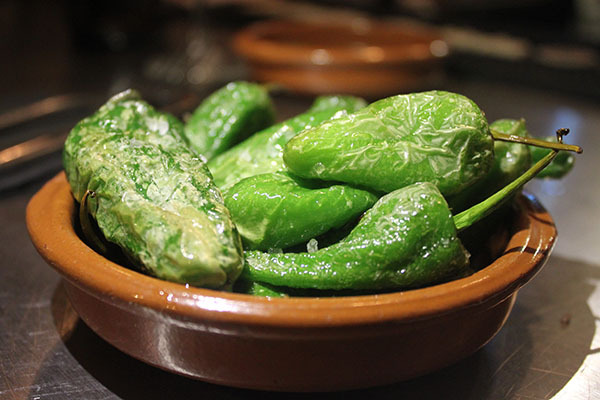 She also asks John to bowl up some Pardon Peppers (£4) for us as they make the perfect accompaniment to our aperitif. According to the menu, one in ten has a kick. Unfortunately, not one of our ten… but a great way to start the night none the less. We are given the choice of a Spanish or Portuguese red, once we have polished off the aperitif. 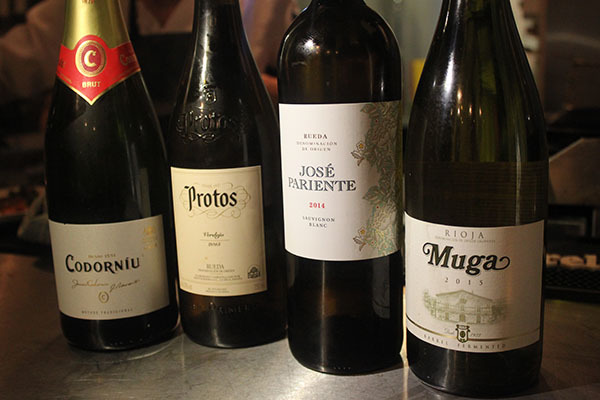 From a decent selection of wines that the waitress is keen to show off, we are brought a bottle of Porta 6 2012 (£5.25 per glass/£20 per bottle) and Pizarras de Otero 2014 (£6 per glass/£22 per bottle) to try. We both agree that we prefer the Porta 6, although both wines are very drinkable. As you might expect, the alcohol selection is dominated by Spanish whites and reds. No bottle is priced over £30 and the waitress is passionate and knowledgeable about the menu, confidently educating and advising us. As well as the wines you will find a Cava, a range of specialist spirits (vodkas, gins, rums and whiskeys) and one beer – Estrella Galicia. In order that we can appreciate each individual plateful, it seems that John is serving our dishes to us individually. Having said that, there is only a little waiting time between them, so you could hold off and enjoy a few at a time should you wish to. We enjoy the following dishes as they are brought to us. Iberico pork fillet with kimchi and Korean BBQ sauce (£7) is rich and sweet. A veteran compared to the other newbie dishes that make up our meal tonight and the only one we requested – for the love of kimchi! Meaty slabs of pork, decorated in pickled kimchi and covered with a light, but fruity and flavourful BBQ sauce. Tonkatsu scallops with sour apple and roe chips (£7) is a dish I would undoubtedly order again. Roe chips are something I have never tried before. Chips might be a little misleading, although I struggle for another word to describe the little fried, salty, dehydrated roe slices that adorn this dish. They are really quite interesting, more chewy than crispy, tasting entirely as you would expect and working very well with the apple and the mild flavour of the scallops. Scallops done well need no embellishment, so all I will say is this dish is a real success. 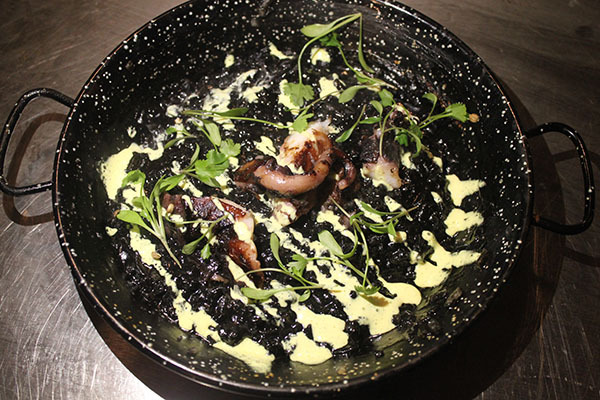 Arroz negre and octopus with saffron alioli (£8) is a dish to behold. Dark and black with chunks and curls of succulent, tender octopus stirred through. Swirls of alioli add a nice colour contrast against the black and make a super garlicy addition to a wonderfully rich dish. 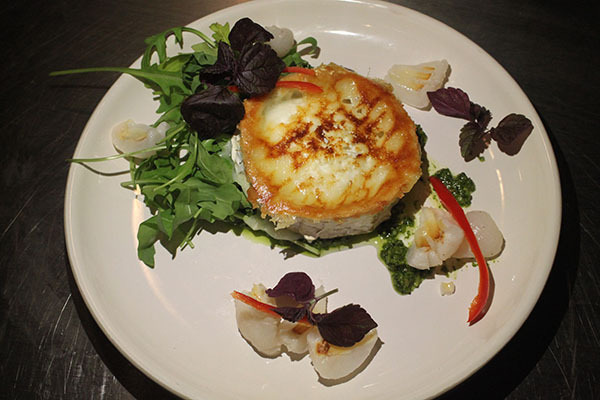 The fried goat’s cheese with lychee and Asian pesto (£6.50) is perfectly put together. A seamless pairing of creamy, citrusy goats cheese and sweet lychee, complemented further by a pesto with an Asian twist – made of basil, coriander and mint. A dish that is just as pleasing to the eye as it is the taste buds. It sounds so simple, but the grilled tenderstem broccoli with bean and cashew salad with tofu dressing (£6) is a real triumph in flavour. 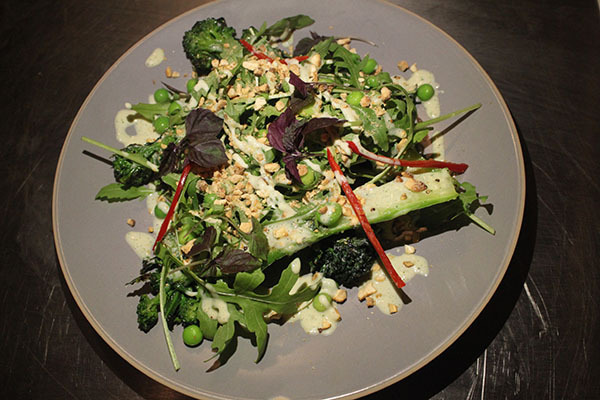 Crunchy tenderstem and cashews dressed in a wonderful sauce of silken tofu, coconut milk and chilli. Beautifully green and fresh, quintessentially Thai and such a delight to eat. A flawless vegetable dish alongside its richer counterparts. All the above had been selected from the Raciones menu. 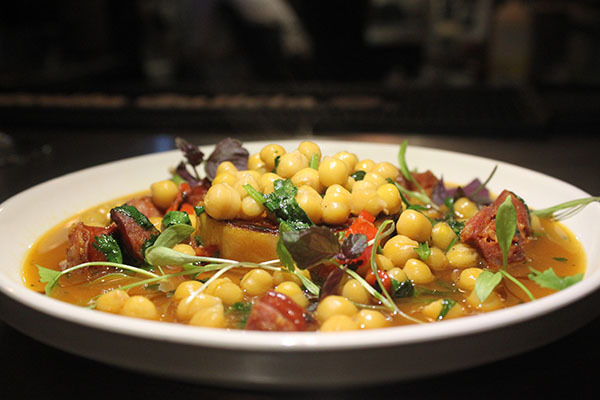 The butternut squash and chorizo with chickpea and Asian broth (£5) is the only dish John selects for us from the Tapas menu. 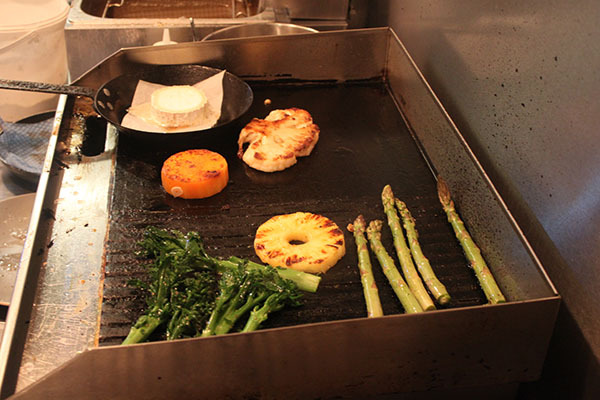 We have been watching the thick slice of butternut squash grilling on the hot plate since we sat down. This way of cooking the squash has given it a fantastic chargrilled flavour. Sweet and smoky, paired with chunks of spicy sausage and chickpeas. The Asian broth has notes of fish sauce, soya sauce and coriander, but as a whole this dish nods to flavours more typical of Spanish cuisine. Our last dish hasn’t even made it onto the menu yet, it’s that new. I think John has spotted our appreciation for his cooking and so he treats us to one more plate. Braised beef shin and confit carrot cooked in sesame seed oil. This melt in the mouth meat is served with a rich sauce, created from a stock which has been cooked for four to five hours. The dish is indicative of a homely Spanish stew rather than an Asian curry; it is comforting and hearty and thoroughly enjoyable to devour. Last but not least, a palate cleanser! 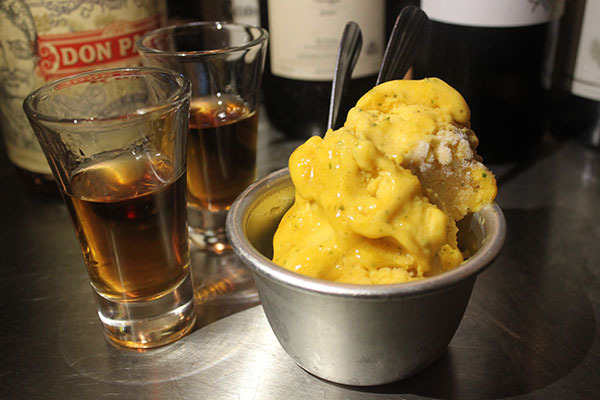 Finally we are persuaded by a sorbet to cleanse the palate and something else boozy. We are presented with a shot each of Don Papa Small Batch Rum (£4), which has hints of vanilla, and two scoops of refreshing mango sorbet with two spoons. I’m not sure we could have managed anything more formidable and I can’t think of a better way to end our journey. And it has felt like a journey. One we have really relished. One we would be happy to take again. And one that we won’t forget in a hurry!